I’m getting closer to catching up on projects around here. For example I’m down to one scrapbook to catch-up on (see blog posted May 20, 2009). Though by the time I order pictures again I’ll have at least 3 months worth of new pictures to attend to. But as my baby girl grows, I take fewer pictures each month. And we haven’t had a major outing since March so there isn’t a photo-documentary waiting to be freed. Translation= it should be easier to keep up on things from now on… or at least this next time. One thing I have done lately is taken several videos. Those have been fun. Just thirty-ninety second snippets of my kids at play: recording their laughter and movement. Oh, and my mother gave me a little photo album of random pictures of me from the time I was a toddler until my twentieth birthday. So those will have to be placed. Some might be duplicates from shots I already have in scrapbooks. If that’s the case, I’ll pass them along to unsuspecting family members so they can strategically place the oddball photos instead of me. The photo on this page is from the batch my mother gave me. Yours truly, in my Wonderland, October 1995. It was in this room where “Wonderwegian” was born. I was always changing things around. Posters on the ceiling as well as globes and record albums hanging, too. And that’s just a third of the room, with my “black and white wall” taking up the main backdrop. 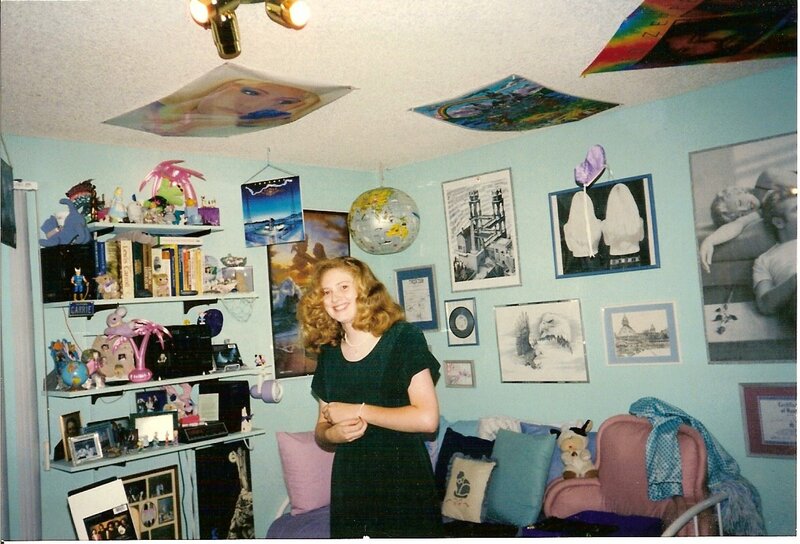 The other walls (and ceilings) were covered with a colorful assortment of rock posters/albums and nature prints. My taste has always been all over the place but I like to think that now I have less clutter. This entry was posted in childhood, DECORATING by Carrie Dalby. Bookmark the permalink.